Height: Slightly less than 150cm (4'11"). Production Note shows a height revision to 152cm (5'0"). For further details, a 100 Question Survey has been published revealing details about Madoka such as her likes, dislikes, hobbies, and physical attributes. ↑ Originally her Magia attack was named Puruwia Magica before it was changed in an update included with the 2018 New Year's event. An incredibly gifted magical girl who operates in Mitakihara City. She is a second year at Mitakihara Middle School. Her family consists of her father, mother, and little brother. Because of her innocent, gentle personality and her thoughtfulness towards others, she always has people around her. During battle she uses a bow as a weapon. 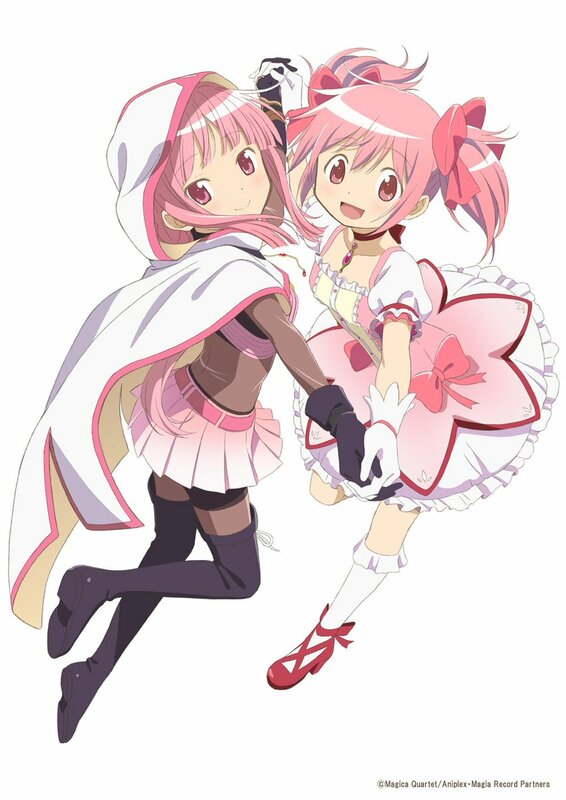 Madoka and Homura Akemi arrive in Kamihama City. They decide to go to a shrine Madoka saw in a magazine. However, the two are stopped when they sense a witch. The girls head into the barrier and find a magical girl fighting it. Before they can help, the witch escapes and the barrier vanishes. Madoka and Homura go up to the girl and asks if she's alright. The girl says not to worry and leaves. Madoka apologizes to Homura and runs off to look for the magical girl. Elsewhere, the magical girl feels tired as she used too much magic. Madoka appears and tells her to rest, offering to take her to a bench. Madoka offers to buy the girl a drink. She asks for iced tea, which prompts Homura to appear and offer to buy it. Homura says she'll gladly do it for Madoka. The magical girl thanks Madoka for helping her, and introduces herself as Shizuku Hozumi. She asks why Madoka came to help. Madoka says it's because Shizuku looked like she was in pain and that she randomly decided to help. Shizuku says Madoka is a kind persona and tells her not to worry. Madoka says it's bad to be alone, since if you're alone there's no one who can help you bear painful things. Shizuku says it's fine even if she's alone, and she'll find a place where she'll belong. Madoka says that as things are, it will always remain painful. Shizuku says that Madoka is trying to help her even if she's a stranger. Madoka humbly dismisses Shizuku's compliments, and then realizes Shizuku herself could create her own place to belong. Homura then returns with drinks. Afterward, Shizuku asks Madoka why she became a magical girl. Madoka says she wants to be useful to someone, as she doesn't have a subject or talent she's good at. She became a magical girl to change that about herself, and that's why she was glad to help Shizuku. Shizuku thinks that Madoka made a place where she belonged by becoming a magical girl, and thinks she could do the same someday. She then thanks Madoka for giving her hope and leaves. Madoka thinks she's lucky to fight alongside the people that are important to her, and goes off with Homura. Madoka makes an offering to a shrine, praying for everyone's happiness, health, and the ability for her to protect everyone. It then starts raining, leaving Madoka wet when it stops. A girl offers Madoka a handkerchief and explains they just missed the bus. Madoka notices the girl has a book called "Waltz of the Maneki-neko", which is a book she likes. The other girl admits it's her favorite book. Madoka introduces herself to the girl, who says her name is Kako Natsume. The two spend the time talking about the book, eventually going their separate ways. Madoka goes to a bookstore at the shopping mall and buys "Tango of the Maneki-neko", the sequel to the book she talked about with Kako. Kako herself is in the bookstore, to Madoka's surprise. Kako asks Madoka if she's a magical girl, saying she saw Madoka's Soul Gem ring. She reveals she is one as well. Madoka thinks this must be the Maneki-neko's work. Later, Kako invites Madoka to come on a night-time adventure at her school. The next week, Kako and Madoka meet at the school, preparing to go to the roof. As they try to go inside, the girls are startled by a cat. Kako says they can't seem to enter the school, so instead she suggests transforming and using their powers to hop to the roof. Once there, Kako tells Madoka to look up at the starry sky. Kako explains that on this day of the year "you can see the most beautiful stars". She says she learned that from "Waltz of the Maneki-neko". Kako claims the school rooftop is the best place to watch the stars. Madoka thanks Kako. Kako admits she's shy and has trouble talking to people, but somehow she can talk properly to Madoka. Kako says this star viewing is her thanks. Madoka says that Kako's honest feelings got through to her. The girls affirm their friendship. Sometime later, Madoka and Mami Tomoe fight a witch. Madoka sees a normal person was kidnapped by the witch and brought into her barrier. Mami tells Madoka to bring the person out of there while she handles the witch. A magical girl appears and says she's impressed that Madoka's helping people. She introduces herself as Sasara Minagi, "the 'knight' who protects this city". Sasara says to be precise she's a knight that protects everyone, and asks Madoka to leave saving the victim to her. She points out Madoka can then go help her own friend fight the witch. Madoka agrees and returns to help Mami. Together, they defeat the witch. The barrier vanishes and the duo meet Sasara outside. Sasara says she brought the victim to the hospital. Madoka thanks her, and Sasara says her and Mami are quite strong. Sasara says they can call her if they're in trouble. She says that rescuing people is her specialty, and wonders if it would be easier to say she's a magical girl rescue worker. She says that protecting everyone is her creed, though admits that when she says it like that, it's embarrassing. Madoka says she's cool. Sasara says she happy to meet magical girls like Mami and Madoka. She explains that with Kamihama having more witches, more magical girls have come to fight them - but they only care about fighting witches, not saving people. Sasara says she wanted to become a knight because she can't accept people being sacrificed in the process of defeating witches. Mami agrees with Sasara's opinion. Sasara admits she knew there were people who thought the same way, but almost never met any. Madoka says she became a magical girl to help people and says she's like Sasara herself. Sasara says Madoka is an incredible magical girl. Mami says Madoka might be the strongest magical girl someday...but she has a long way to go. Sasara says both girls are worthy of taking the title of "knight". When Mami points out they use projectile weapons, Sasara says they can be a rescue team. She offers to team up with them, but Madoka and Mami point out they're not always in Kamihama. Madoka offers to help Sasara if she's in trouble and they're in Kamihama. Sasara thanks them and departs. Afterward, Mami says that Madoka is too kind and too honest. She wonders if Madoka is walking a path of battle. Madoka points out Mami is walking the same path. She says she aspired to be like Mami, who is her ideal magical girl. Mami thanks Madoka but tells her if she's truly in danger it's better to run away. Madoka says it's fine, because she doesn't have the courage to sacrifice herself. Mami invites Madoka for tea once they return to Mitakihara. Madoka narrates how she wants to protect everyone with her own power. While watching evening fireworks on the beach, Madoka and company run into some other magical girls and decide to watch fireworks together. Madoka, Ren Isuzu and Kyoko Sakura pick out fireworks. Madoka then goes over to Homura and asks if she's tired. Homura says she never thought she would set fireworks with so many people, and says she's very happy. Madoka agrees, and says she wishes it could last forever. Madoka then says that eventually the fireworks will run out and they'll be too tired to play, so they should all enjoy the present. Homura agrees. Elsewhere, Hinano Miyako scolds Emiri Kisaki for pointing fireworks at other people. Emiri says they have too much energy and accidentally let's one off. The firework nearly hits Sayaka Miki. Mami runs over to see if she's ok. Madoka and Homura chuckle on seeing this. Madoka says they should set off their own fireworks and proceed to do so. The girls say the fireworks are pretty. Madoka appears in Homura's side story. The illustrator of her Four Star card is Sasagi Koushi, and her Five Star card is illustrated by Aoki Ume. Doppel Sprite. See Kriemhild Gretchen. Anime Japan 2017 Doppel card. Madoka, with Iroha and Felicia. Accele MP Gain UP [III] Passive The girls who signed contracts. The girls who were hesitant with their contracts. Even still, they are together. Embrace Your Hopes and Dreams! Attack UP [III] Passive ”Do you think it's a little too flashy?" The ribbon I had chosen with help from my mother swayed in the gentle breeze as though it was being tickled. It was a calm moment without a trace of despair. 5 turns There is a big gap between a normal girl and a magical girl. It's not visible, but it's a big, big gap. But when I took my thoughts and my wishes It is possible to overcome it by one step. Keep This a Secret From Everyone! Before she realized it, she was admiring the idea of "magical girls". Regenerate HP [II] & Status Ailment Resistance UP [III] Passive Let's go out, dressed in a pure white dress. What if we get dirty...why, how thrilling, when two people are together, surely they can enjoy anything, right? Come on, let's tightly hold hands so we don't miss anything, don't lose out way. Magia UP [III] Passive She has a strong belief. There must be a way for the two of us to laugh together. Just because we haven't found it yet now, it's sure to be somewhere. And I'm sure I can find the way. Max Limit Break: Anti-Curse & HP Regen [I] Passive I didn't know that there was such a lovely place with warm sunshine and open space like this at the place where my friends invited me to come! Sayaka: "Okay, let's do it ... that's it!" Madoka: "Kya! Sayaka-chan, it's cold!" Kyoko: "Woah! Stop it! You're melting the ice!" Sayaka "Hehe! Melty Melting!" That's Not a Doll, Right? 8 turns Parallel worlds, parallel routes. A world where monsters exist, a world where there’s miracles and magic. When two worlds that shouldn’t overlap happen to intersect…A new story begins. 6 turns "Oh, Kaname-san, you've got a really nice decoration." "Mami's cake seems to be very delicious, too." "I made it by hand today, I wonder who that is? Miki-san should have just gone out for a drink..."